From my family to yours... Merry Christmas! I know, right. One more gift guide? Really? But, this is a good one. You've bought all the gifts, checked everyone off of your list. But did you remember the stocking stuffers?! I've got a few ideas for you that might be better than the dollar bin at Target. Although, I'm not knocking the dollar bin at Target. Love me some Dollar Spot. But these stocking stuffer ideas are original, unique and, well, uncommon. I'm all about endorsing companies that I truly love, value and use and Uncommon Goods is certainly one of those. Straight out of Brooklyn, New York, this company has some really great creds like they employee workers who make 50% more than the minimum wage. Or half of their goods are made by hand. Or even better, over a third of their products are made from recycled products. Amazing right? And oh, by the way, their products are all pretty amazing and I can speak from personal experience. I've been using Uncommon Goods products for years- one of my kids favorite toys to this day is the cone crayons they can put on their fingers! Well-made, quality, innovative products. So who wouldn't want such great, unique products in their stocking this year?! Thanks to UG's Christmas gift list, which you can check out here, there are a ton of options. A few of my favorites are the avocado tree starter kit found here, the wooden kitchen utensils found here and the unicorn headband found here. By the way, everything I snapped in my board above (with the exception of the super cool beard kit, $40) is less than $25. That's amazing, people! The perfect list of stocking stuffers. For more ideas, head here for women's gifts and here for men's gifts. So, what's Santa putting in your stocking this year?! 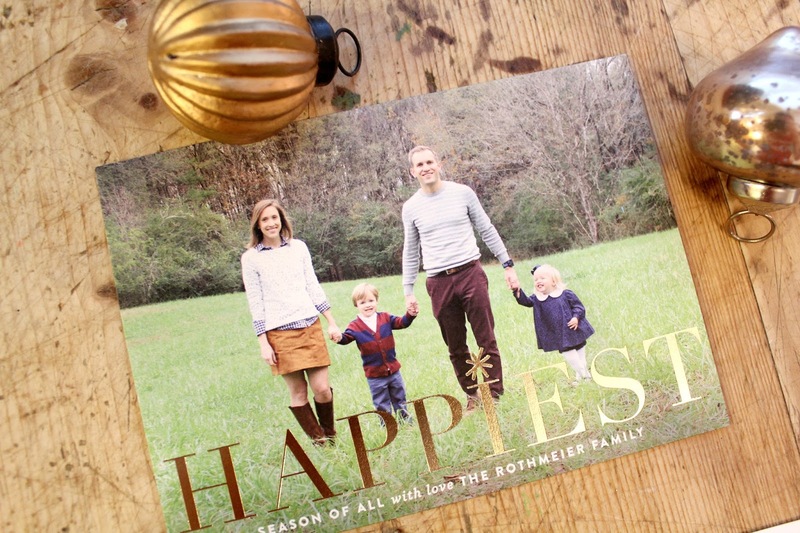 *Thanks to Uncommon Goods for partnering up with me for this post. Christmas mantels are kind of my jam. Every year, I use our fireplace mantel as sort of the piece de resistance for our Christmas decor. It's just my thing. One year, Better Homes and Gardens even featured this mantel on their website! I'm sort of a big deal. Kidding, kidding. 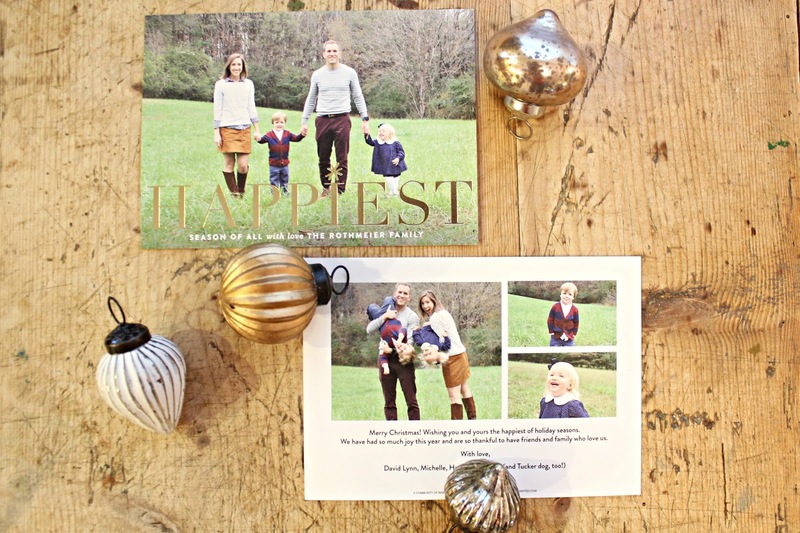 This year's mantel is so low-fuss that I almost didn't share it with you guys here on the blog. I mean, anyone can stack a couple of pieces of kiddo art on a mantel and call it decorated, right? 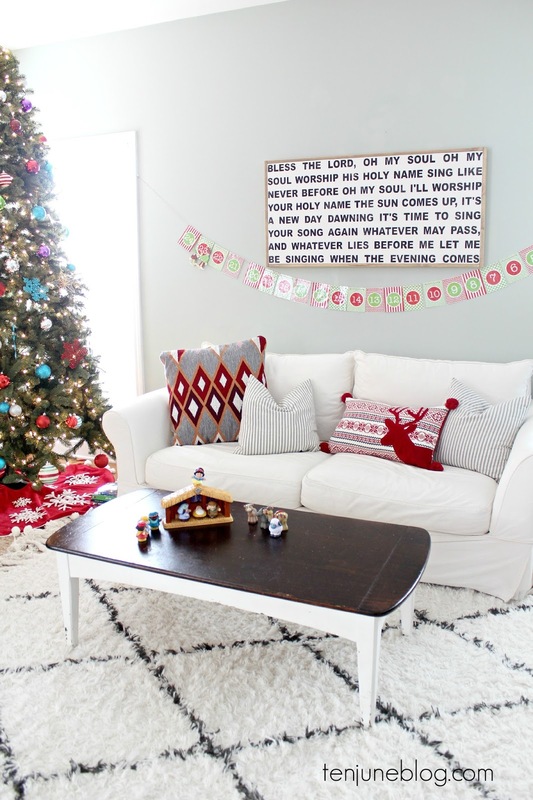 But then you guys had so much love earlier this week for this post and my proclamation to love the ordinary this season that I thought hey, why not share. 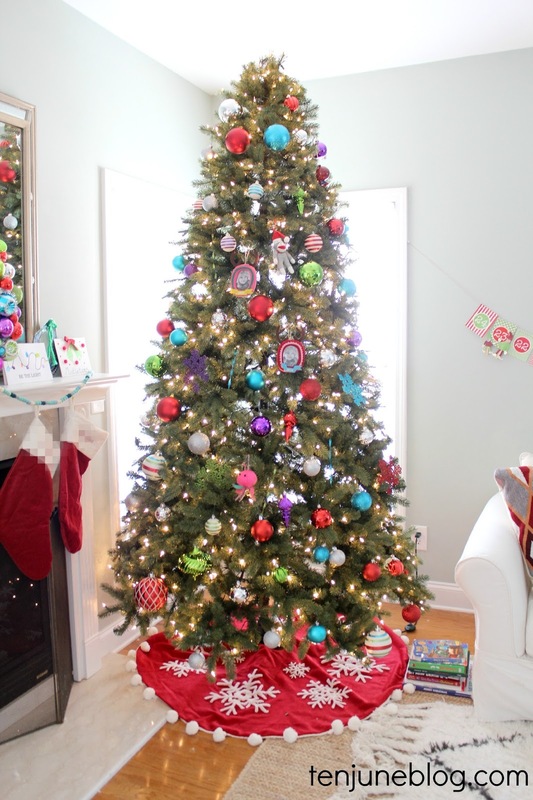 Maybe someone will be inspired to feel less pressure to decorate perfectly and more pressure to decorate for your family. I'm sure next year I'll be inspired to create a beautiful Christmas mantel (especially if we're in our new house by then!) but for this year, I'm enjoying our no-fuss, kid inspired Christmas decor. 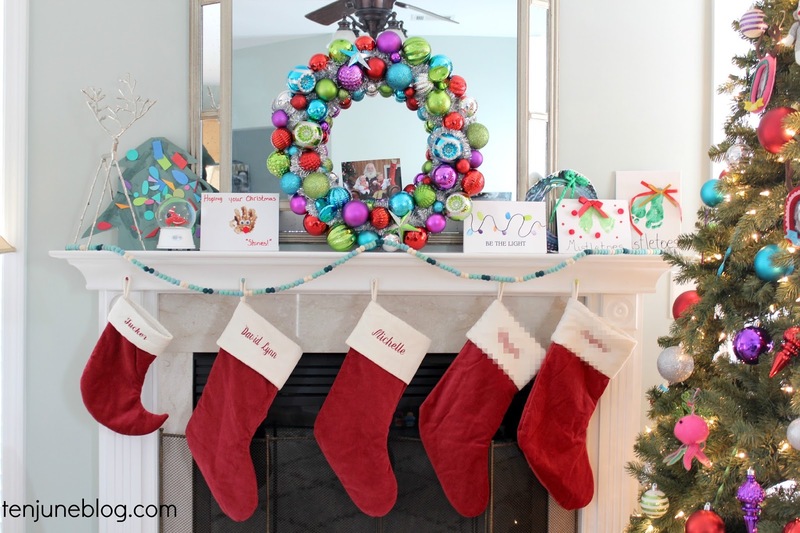 Feel free to check out my previous years' Christmas mantels if you are in the mood for something pretty! I'm so glad you guys loved my Elf Yourself advent calendar! 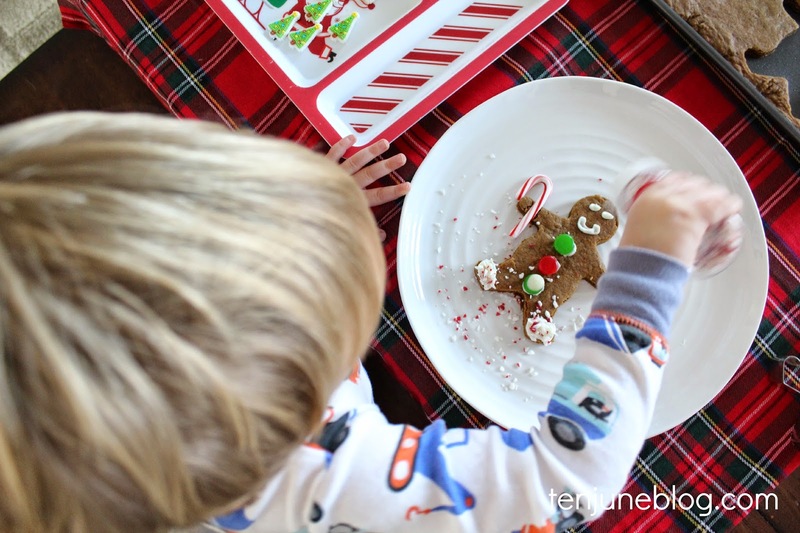 Our kiddos love it and I think it's pretty hilarious to see them dressed as tiny elves, so be sure to get one started this year or bookmark it for next year. 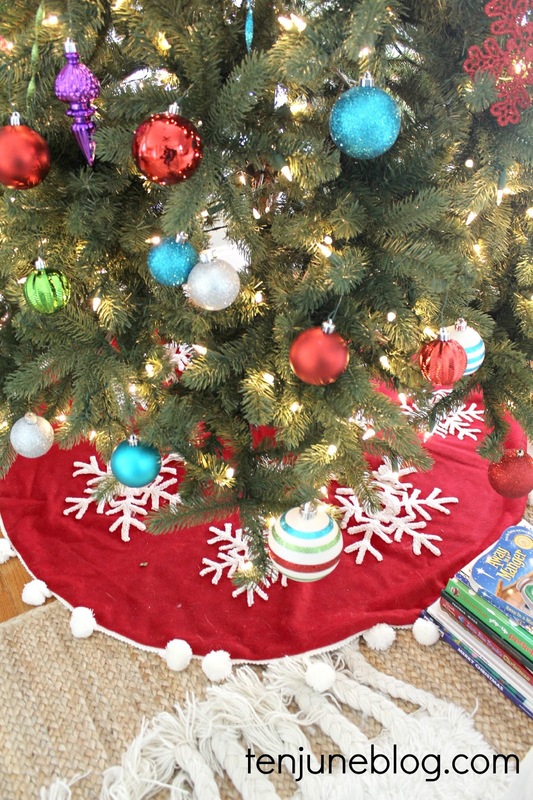 Today, I thought I'd share some of my favorite do-it-yourself Christmas and holiday projects I've done over the years. My theme? Fun, festive, easy. Think you can sign up for that?! Even though HDawg is officially able to eat dairy now, I'm sure we'll recreate this dairy-free gingerbread man experience from last year. 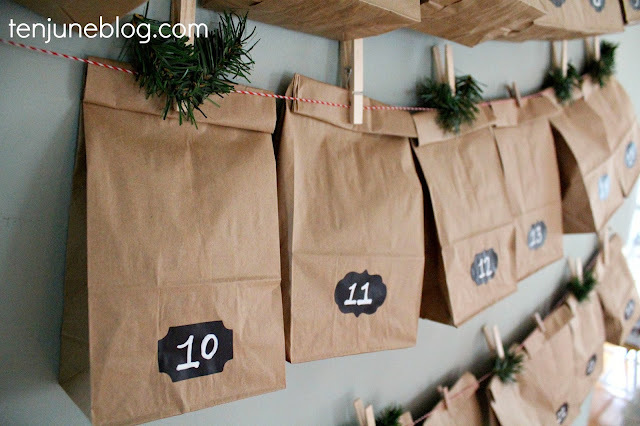 If you're in to sharing small gifts for advent, check out my rustic paper bag + chalkboard tag advent calendar. You can fill each bag with small goodies throughout December. 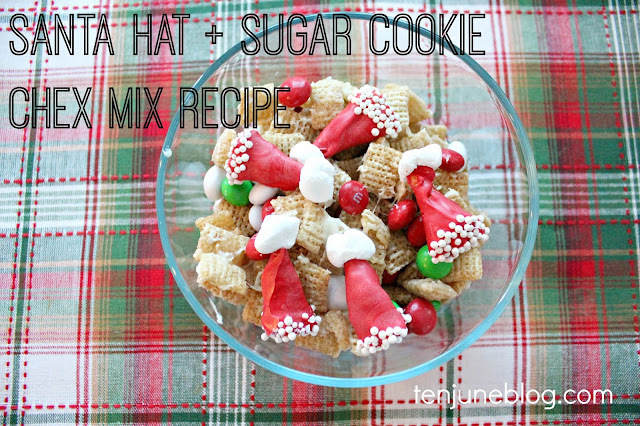 My Santa Hat Bugle and sugar cookie chex mix recipe is a big hit at Christmas parties and so easy to make! 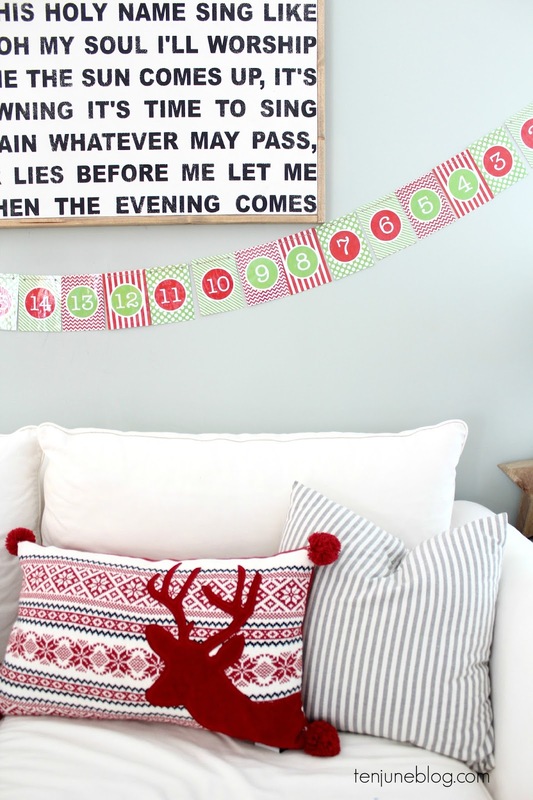 On the decorating side of things, another simple craft is this holiday pinwheel garland. 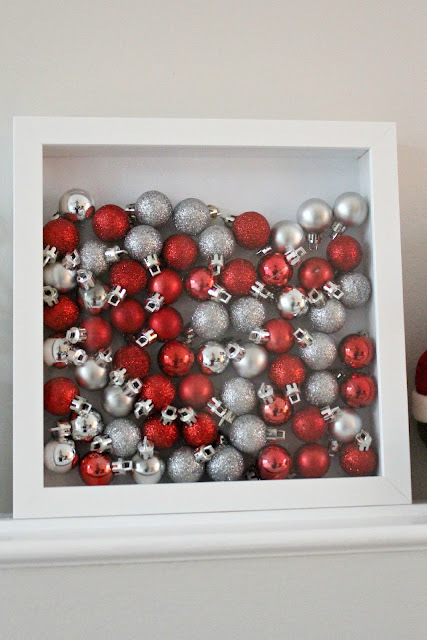 Pinterest loves this super easy (I mean, really easy) Christmas decorating idea: fill a shadowbox with tiny ornaments like I did in this vignette. Hosting a Christmas cookie party this year? 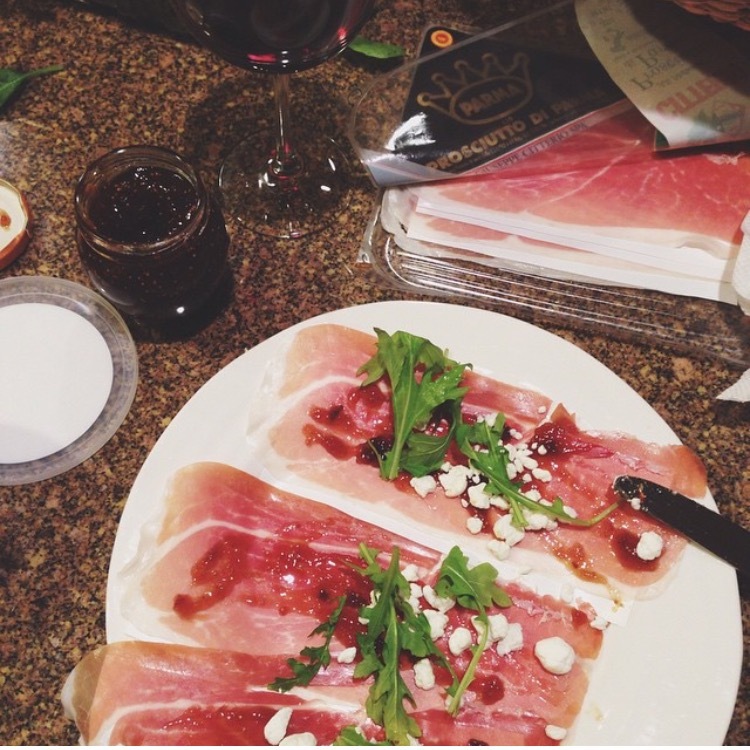 Here are a few ideas from when I hosted mine! 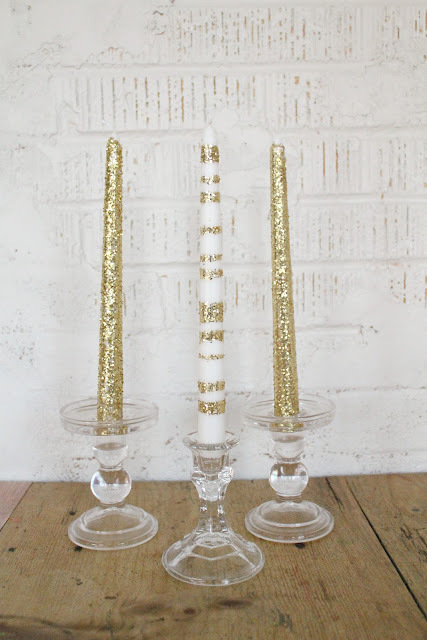 Another favorite decorating holiday project I did was these DIY glitter candles. These could be used for Christmas, New Years or really any special occasion! 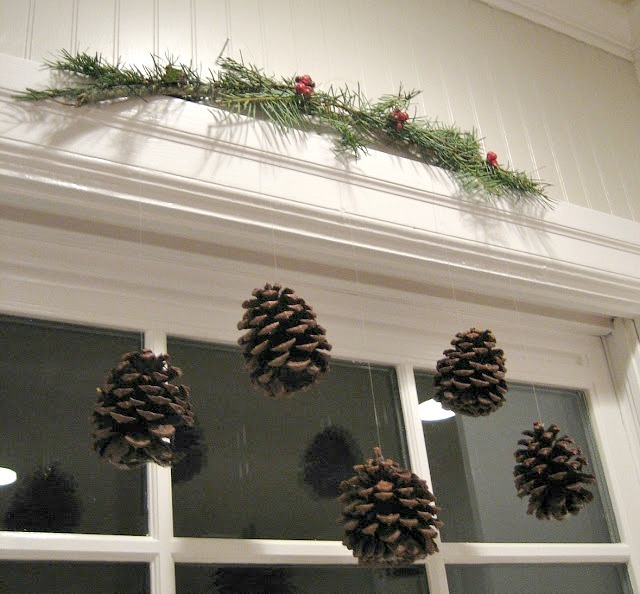 For something a little more different and rustic, try this floating pinecone mobile. 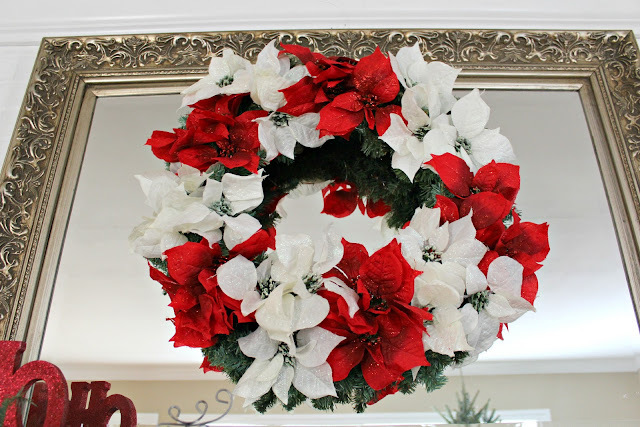 Finally, the queen of easy projects- my DIY poinsettia wreath. 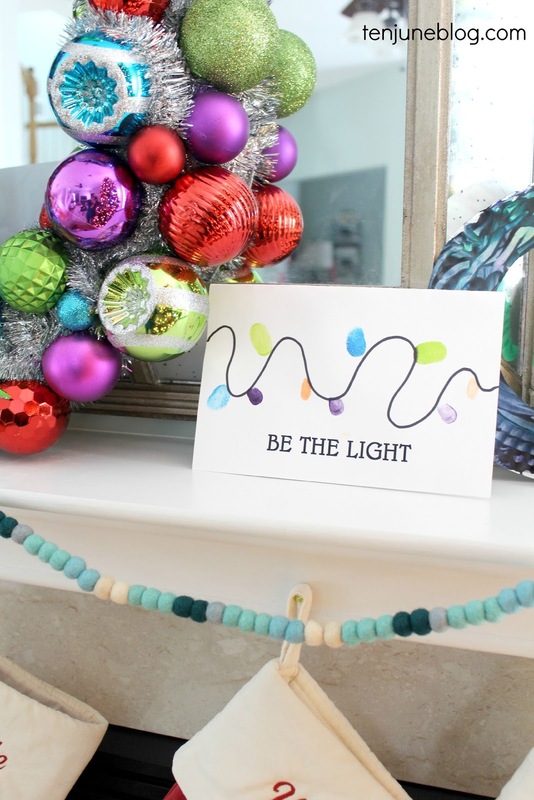 Hope that inspires you to get crafting this holiday season! I know we're already a couple of days into the advent season (let's be honest, it took me a good few days to get my couch and coffee table cleaned up enough to take this photos, although please note the adorable Little People manger scene which Lu so dearly replaced Snow White for the angel, ha! 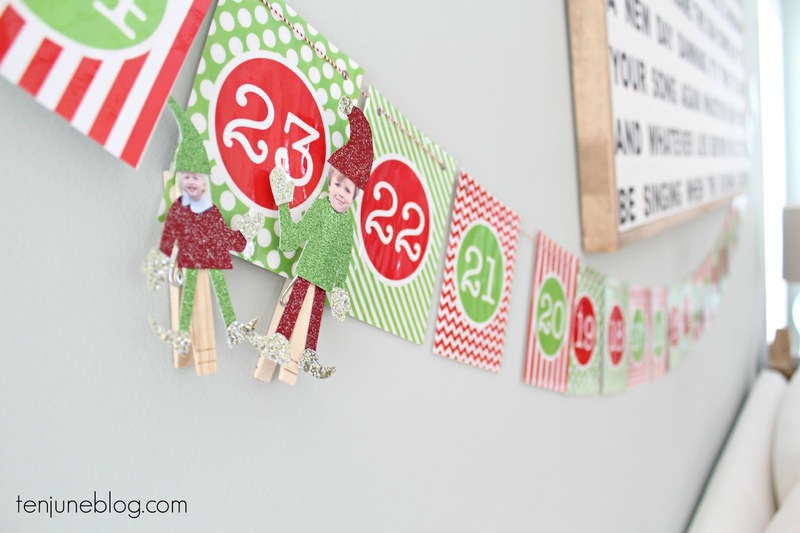 ), but if you're running a bit behind and need a last-minute and easy DIY advent calendar, I've got a good idea for you! 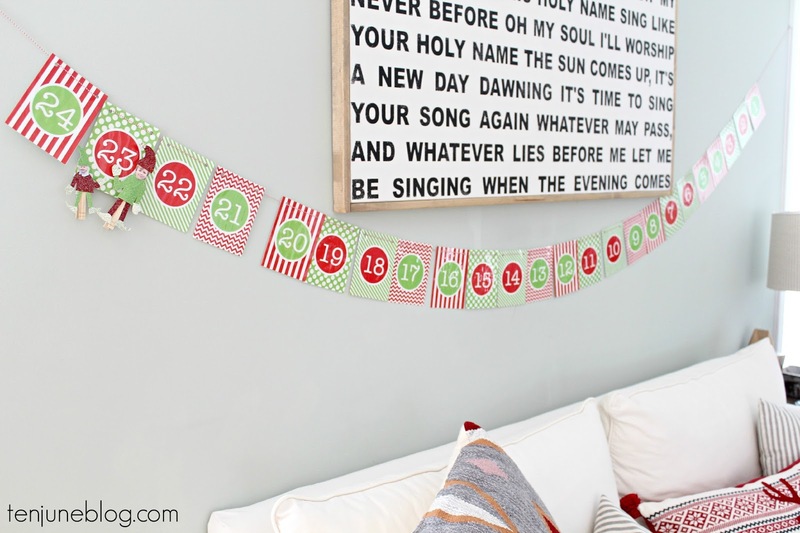 I simply printed this free printable advent calendar (I printed it at my local print shop so it would be high quality color, laminated and cut all for $11!) and then punched holes along the top of each card and strung with red and white bakers twine. Then you've got to create the elf clothespins! 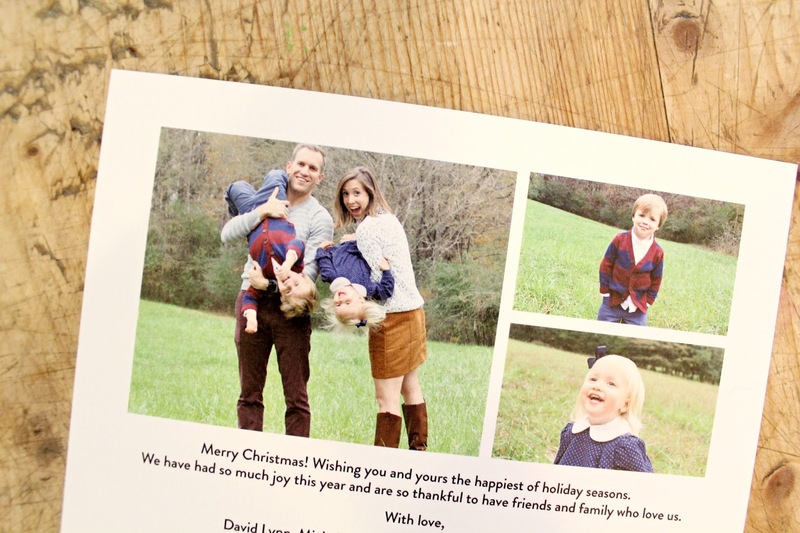 To elf yourself, print a photo of you or your kids and cut out the head. 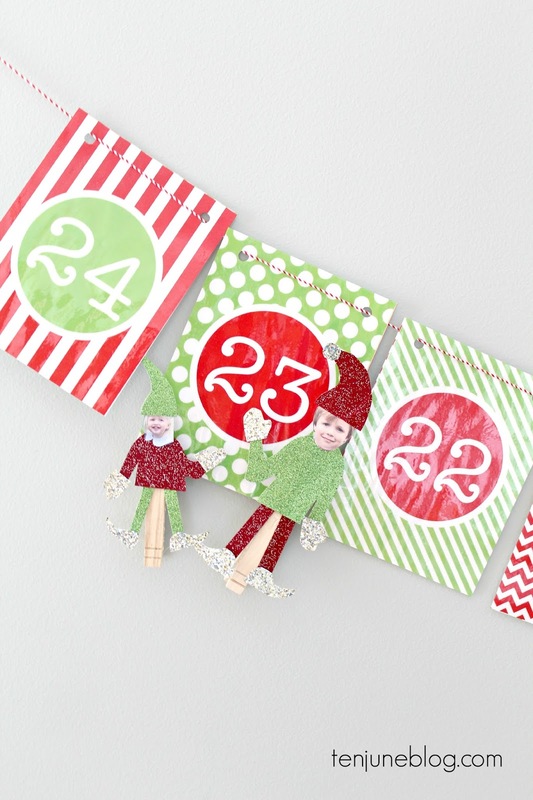 Use glitter card stock to create the rest of the elf- funny shoes, hat and silly outfit. 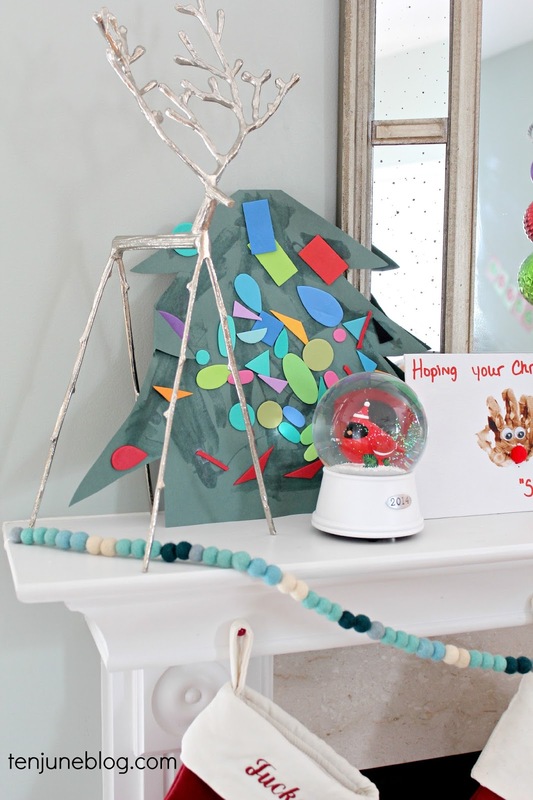 Then hot glue the elf pieces to a clothespin. Each day, the kids get to move their elf closer to the end. When the kids get a little older, I plan to write out an advent service each day (donate old toys, bake cookies for a neighbor, sing a carol to a friend, etc.) and simply tape the service note to the back of each calendar square. 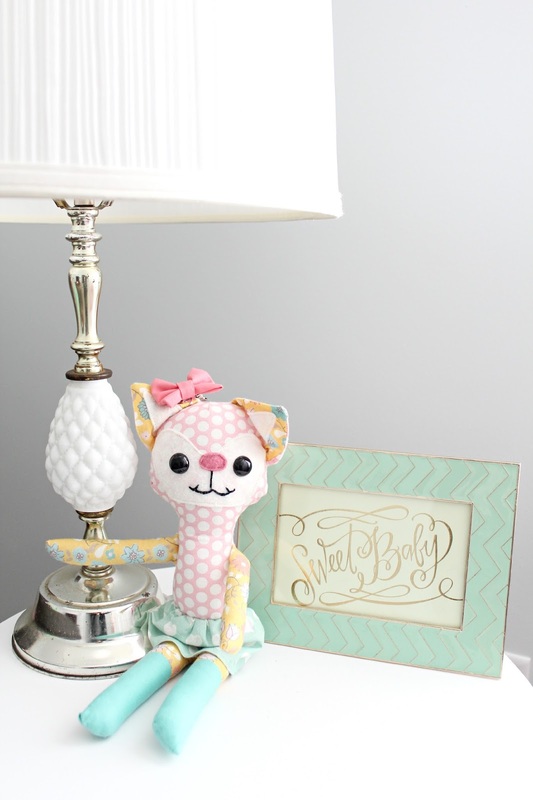 This little project is so versatile! Our kids have already had so much fun with the elf yoself advent calendar and, now, counting backwards from 24 is our new daily hobby. Yesterday we even counted in Spanish. Veintidos! Not bad for such a last-minute and easy DIY advent! 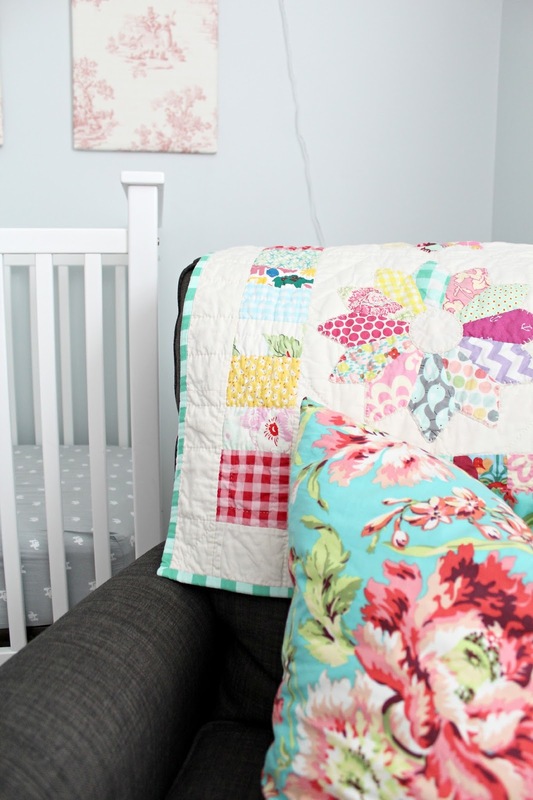 It's been awhile since you guys have seen Little Lady June's nursery, so I thought I'd check in with an update! She's 21 months old and still happily sleeping in her crib, so not much has changed in terms of the main pieces in the room. I moved the DIY stuffed animal heads to HDawg's bedroom and replaced them with a blank, empty wall. I thought the wall needed to breathe a little, do you ever feel that way? No? Just me. Okay, Michelle, stop talking about walls breathing before you freak everybody out. To the left of the dresser, I created a DIY hair bow holder by gluing a sparkly sheet of card stock to the front of a wooden letter I found in the craft aisle at Target. 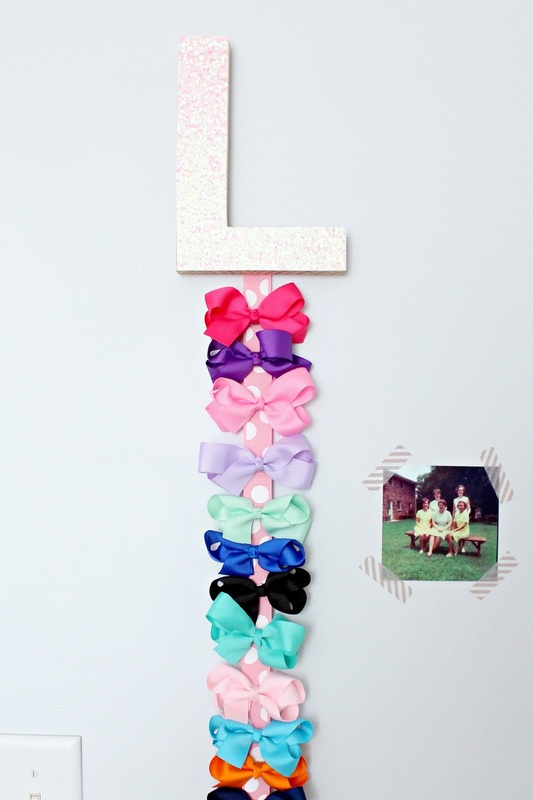 Then I hot glued a ribbon to the back of the letter and bam, a hair bow holder. I also used some simple washi tape to add a vintage photo of my grandmother and her four sisters. LLJ was named for these five ladies, so it's important for her to have their photo in her room! On the other side of the room, I did what every interior design loving blogger momma promises to never do: I added a character to the room. The horrors! 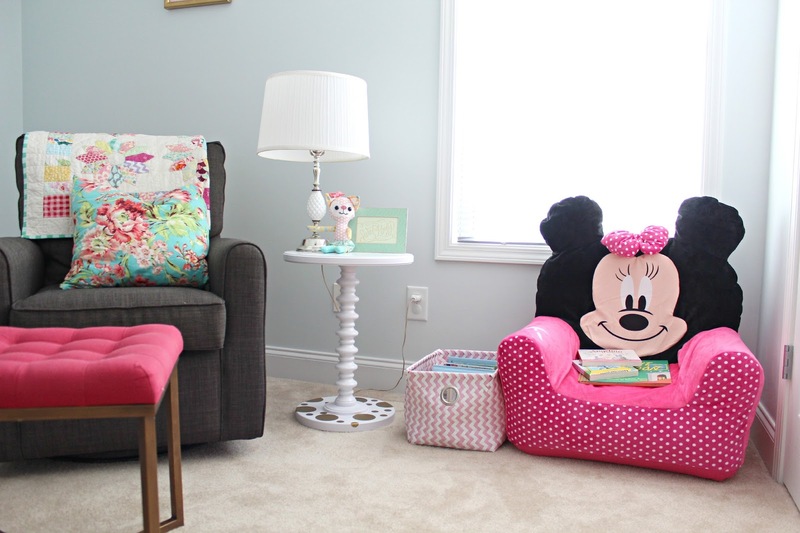 But seriously, my little girl loves her some Minnie Mouse, so it's Minnie Mouse she gets. We go through many, many books a day, so I pulled some of her favorites off of our main bookshelf and put them in a book basket next to her side table. For awhile, I'd walk in her room and find her tucked in the corner, sitting on the floor next to her book basket reading. 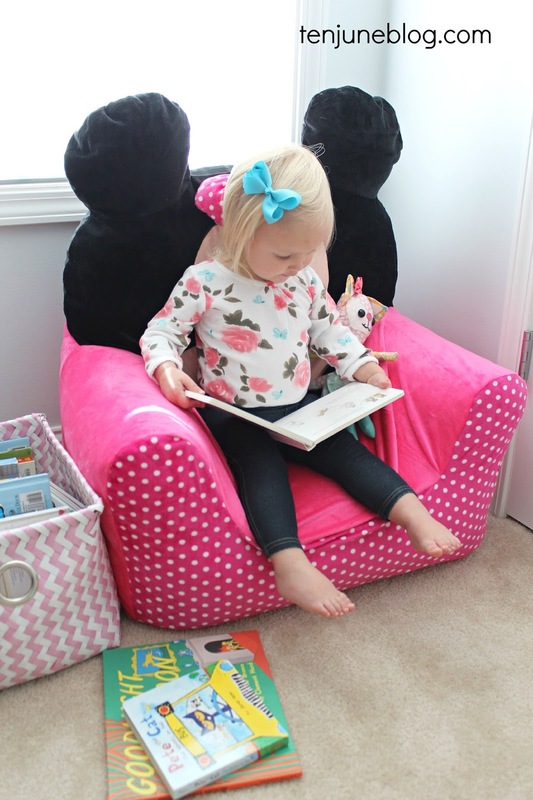 I knew it was high time I create this gal a comfy reading space, so when the folks I'm teamed up with at Savvy Sassy Scouts asked if I... I mean, LLJ... wanted to try out the Minnie Mouse chair by Delta, I knew exactly where it should go. And seriously, she loves it- I find her in there reading all the time. The chair is super cute without being too themey, if you know what I mean. 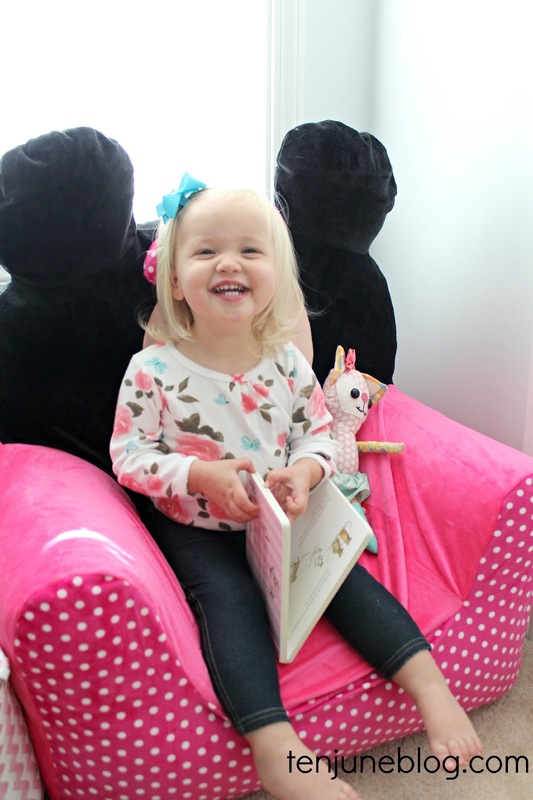 At 21 months and about 26 pounds, she's a little tiny for the chair and sometimes has a problem getting her balance to sit down, but I'm sure she'll grow into it (the chair is recommended for ages 3-9). 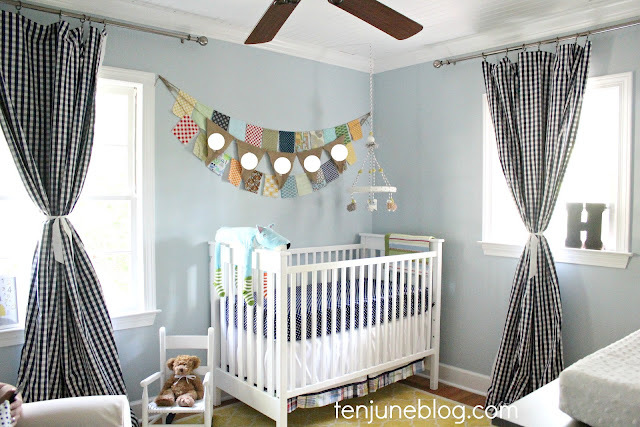 For more information about items in this room and a lots of other photos, check out my original nursery room reveal post and full little girl's nursery source list post. *I received this product as part of my affiliation with Savvy Sassy Scouts. As you guys know, we finally sold our home (after an agonizing almost four year long process which you can read all about here) in October. 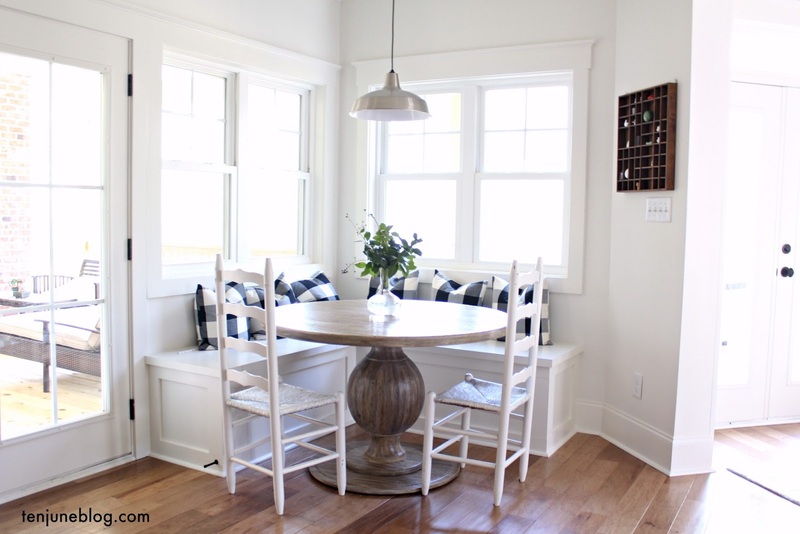 Today, I want to hop back in time and share some of my favorite projects, rooms and spaces from the first home that David and I owned together. 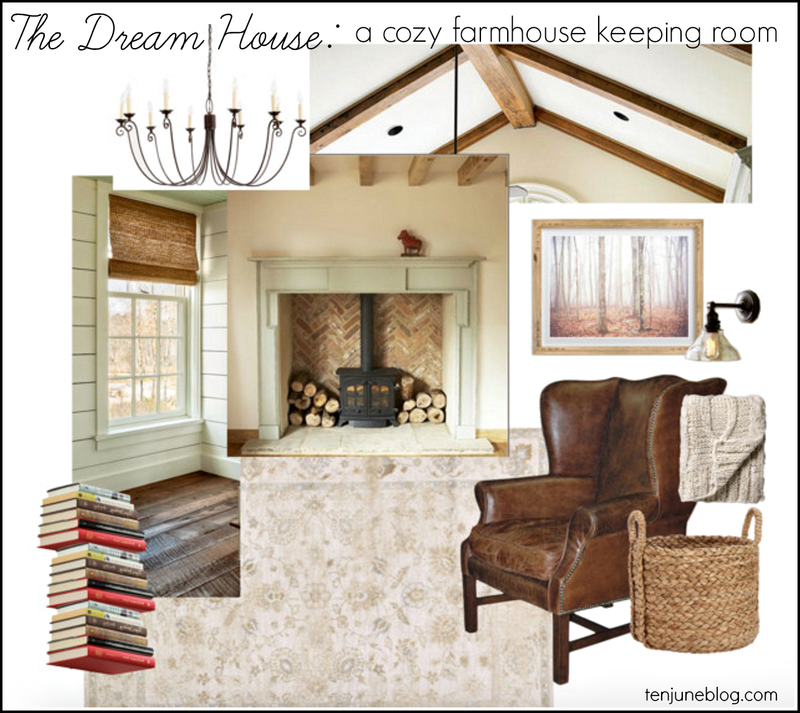 I figured a little blog tribute was appropriate because this blog wouldn't be in existence without this house! So, one last time, here's our renovated ranch. I won't cry, I promise. Okay, maybe a little. Grab me a tissue, will you? While we focused mainly on the interior, I love what we did to the outside of the house. We brought some curb appeal to the outside of the casa with a paint job, reincarnating the house's old black shutters (which the previous owners ripped off, for some reason?! 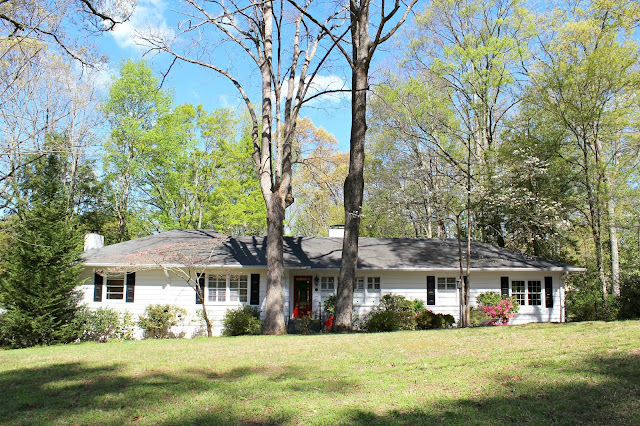 ), a bright red painted front door and lots, and lots, and lots of yard work. Remember that one time I found a dead gopher in the yard (butIdidntreallybecauseimanidiot)? Yeah, we worked hard in that yard! 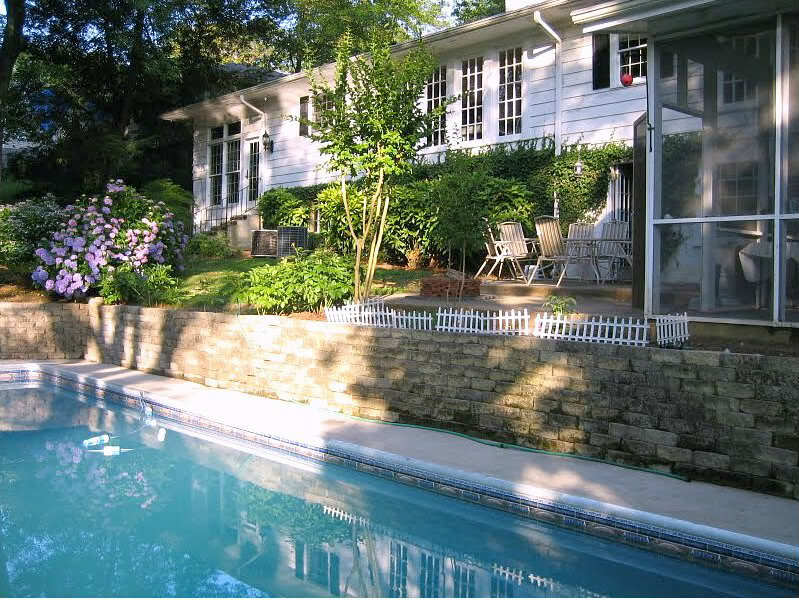 Speaking of the outside of that house, we can't neglect to mention the pool. Hands down, this was the best place to entertain. We had so many great parties, gatherings and memories made at this pool and in the adjacent screened in porch! Inside, there's a three way tie for my favorite room. Is that allowed? I'm doing it anyways! 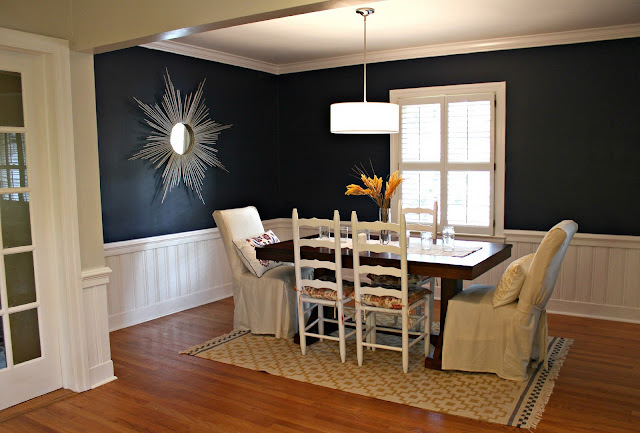 Favorite room part one: our navy blue dining room. 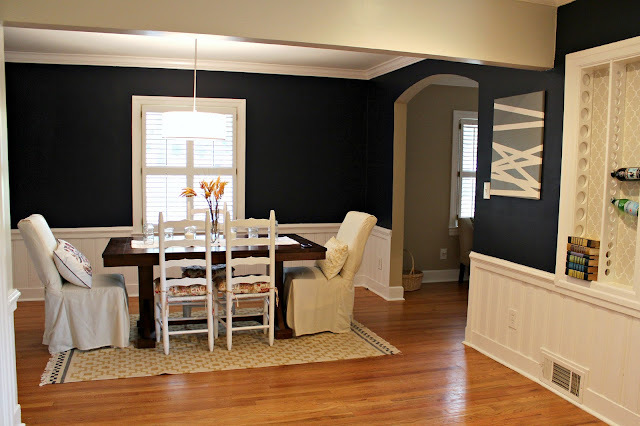 The blue walls, the DIY bamboo sunburst mirror, the stenciled wine rack. Man, I loved that room. So much so that I plan to recreate in our next house, for sure! 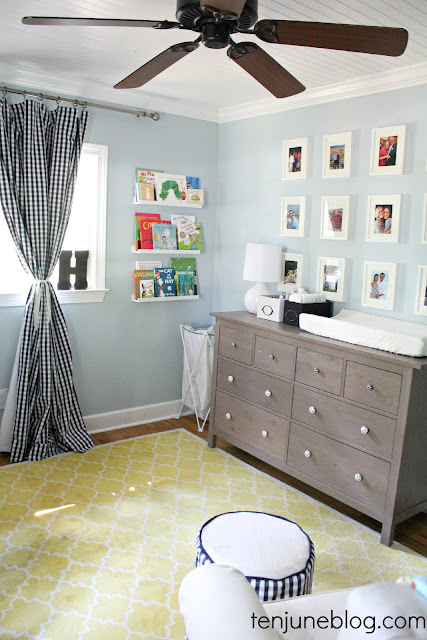 My favorite room part two: HDawg's nursery. To be quite honest, I think this is still one of my favorite rooms that I've ever designed. And I love that I've basically recreated it at both rental houses that we've lived in since moving from this house, so it's like his nursery has always been the same for him. Now that he's three, the room is still such a timeless, classic space that is growing with him. I love it! 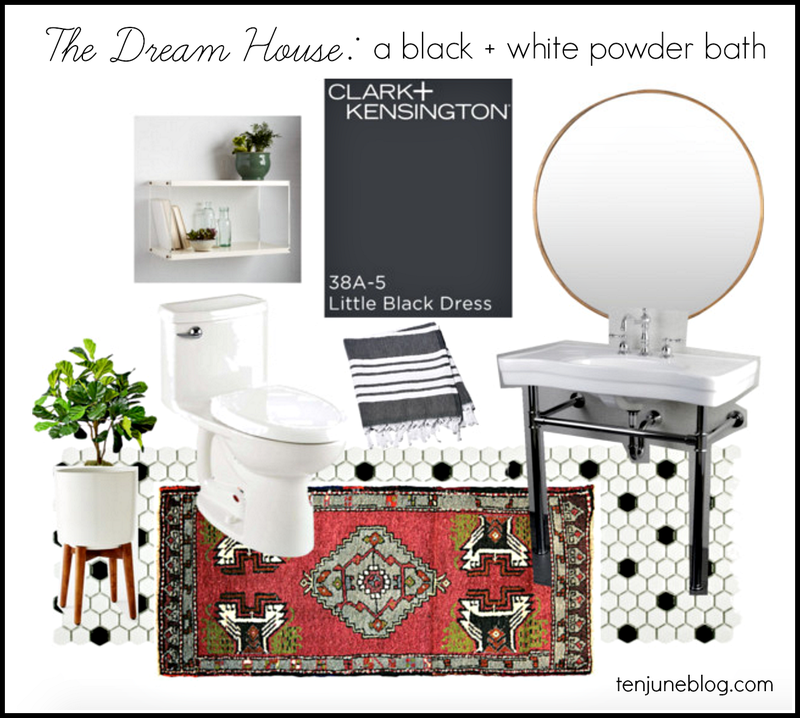 Favorite room part three: our DIY labor of love, the renovated master bathroom. I still can't believe we did so much of that work ourselves. So tough! But in the end, that amazing double shower and beautiful tile was worth it! So those are some of my favorite projects and spaces from that house. 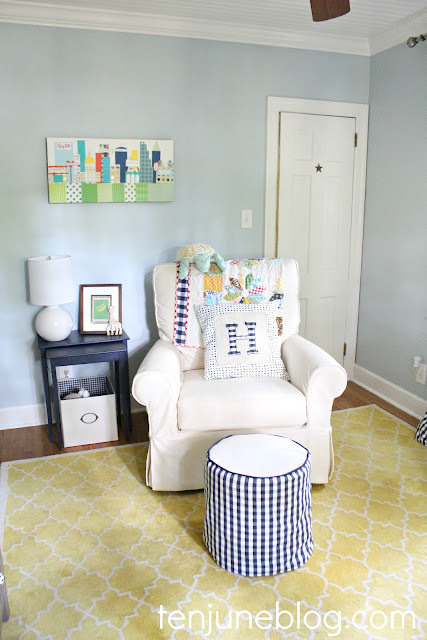 If you want to see more spaces in that house (including an updated guest bathroom, office update, two living room makeovers, a sunroom makeover and a kitchen revamp), check out the full house tour right here! Please tell me you think wistfully about your old houses? We are certainly ready to move on from this house (and on to bigger and better things... stay tuned!) but it's still so special to us!